Get to the root of acne to clear your skin fast. 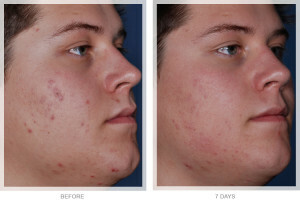 The Obagi Clenziderm™ Acne Therapeutic system is different than other acne products. They are the only systems that use SoluZYL Technology to penetrate to the root of the follicle and clear acne where it starts – deep below the surface of your skin. 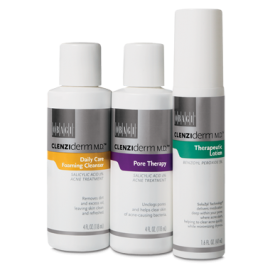 Unlike other benzoyl peroxide acne products, Clenziderm™ Systems contain a unique, patent-pending liquified form of 5% benzoyl peroxide. Because it is liquefied, this powerful medication can penetrate deep into your pores, for quick and rapid results. 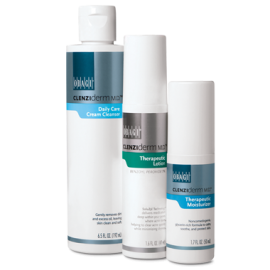 Clenziderm™ Systems are prescription-strength acne therapies from Obagi Medical Products. They are considered prescription-strength. As a matter of fact they are clinically proven to be as effective as a leading topical prescription of benzoyl peroxide/antibiotic combination. Because Clenziderm™ molecules are so tiny (1/10,000 the size of any other benzoyl peroxide treatment available), it can penetrate deep into your hair follicle and kill acne at the root. Clenziderm™ products treat two distinct skin types with modifications in the formulations to address Normal – Oily Or Normal – Dry skin types. Call to discuss which Obagi Clenziderm™ product is best suited for your skin. Adult acne affects 25% of men and 50% of women1 and is caused by three things: too much sebum, bacterial infections, and inflammation of the skin. Watch this video to get some simple tips for treating and helping to prevent pesky acne breakouts and learn how the CLENZIderm M.D.™ System may be able to help clear your skin.